Together with six other award winners, particle physicist Dr. William Shepherd received the highly endowed Sofja Kovalevskaja Award of the Alexander von Humboldt Foundation in Berlin yesterday. 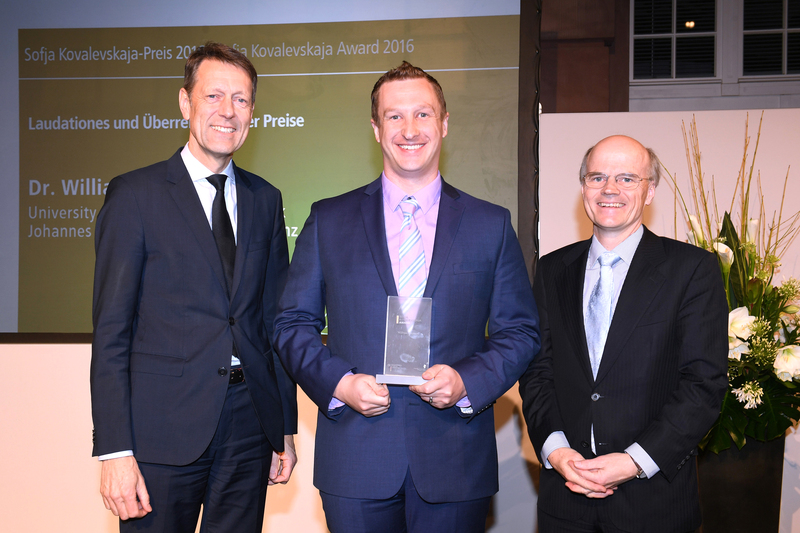 The award was presented by Georg Schütte, the State Secretary at the German Federal Ministry of Education and Research (BMBF), and Enno Aufderheide, the Secretary General of the Alexander von Humboldt Foundation. With the prize money of almost EUR 1.5 million Shepherd will be able to set up a junior research group at the Institute of Physics at Johannes Gutenberg University of Mainz (JGU). The US-American physicist works on theoretical research into dark matter and was formerly based at the Niels Bohr International Academy at the University of Copenhagen in Denmark. Dark matter is one of the greatest unsolved mysteries of our universe. Its nature has still to be established although we know it exists because of the indirect evidence provided by the structural forms assumed in the early universe. Its presence can be experimentally demonstrated in part by the way it distorts the light that reaches us from distant galaxies. "The search for dark matter is so exciting because it is one of the few research fields that provide tangible evidence that the Standard Model of particle physics does not adequately describe our universe," explained William Shepherd. "So our endeavor to understand the fundamental nature of this new particle should also help us to better understand the universe." The Sofja Kovalevskaja Award is granted to young exceptionally promising researchers and enables them to embark on academic careers by establishing their own junior research groups at research institutions in Germany. The award funds are placed at the award winner's disposal for a period of five years to carry out the approved research project of his or her own choice in Germany. Dr. William Shepherd joined the THEP –Theoretical High Energy Physics group headed by Professor Matthias Neubert at Mainz University in September 2016. "In Mainz there is an outstanding group of scientists working in areas closely related with my own particular field of research. There are many theoretical particle physicists here whose expertise I can call on to complement my own work. This is in addition to the large group of experimental physicists who are also working on this research problem, ranging from the ATLAS Group to the CASPER Group. It is really helpful that I can put questions arising from my theoretical work to the researchers who are closely involved in the experiments," said Shepherd of his new host institute. With the funds from the Sofja Kovalevskaja Prize, the physicist can set up his own junior research group consisting of two postdoctoral researchers and up to three doctoral students. "Dr. Shepherd's work enhances our profile in the area of Dark Matter exploration significantly. His research is based on a new innovative approach and is highly regarded internationally. His presence in Mainz will make it possible for students and postdocs in particular to contribute to the solution of one of the most profound puzzles of modern physics." The Sofja Kovalevskaja Award is the most highly endowed research prize in Germany for early-career scientists. It is funded by the German Federal Ministry of Education and Research (BMBF). The work of the Sofja Kovalevskaja Award winner Dr. William Shepherd also forms part of the Mainz-based Cluster of Excellence "Precision Physics, Fundamental Interactions and Structure of Matter" (PRISMA). This program is funded to the tune of EUR 35 million through the current Excellence Initiative of the German federal and state governments.